TAMPA, FL / ACCESSWIRE / January 11, 2018 / The new Atmos Smart Home Control system will offer a simple, seamless solution for managing multiple connected devices - including smart lights, climate control, cameras, security, appliances, and entertainment devices - while you're at home, at work, or traveling. With all the new home devices being announced at the Winter Consumer Electronics Show and those purchased for the holidays, Atmos has developed proprietary technology to link virtually all of them. Atmos is now conducting an online public Title III equity crowdfunding offering (OPO) which is currently listed on the StartEngine website. "Smart home technologies are intended to help us streamline and manage our homes and our lives," says Mark Lyle, Chief Technology Officer, and co-founder of Atmos. "However, most smart home devices don't speak the same language, so trying to set up, access, and control multiple devices, each of which respond to a different smartphone app or communication protocol can be frustrating, inconvenient, and time-consuming." 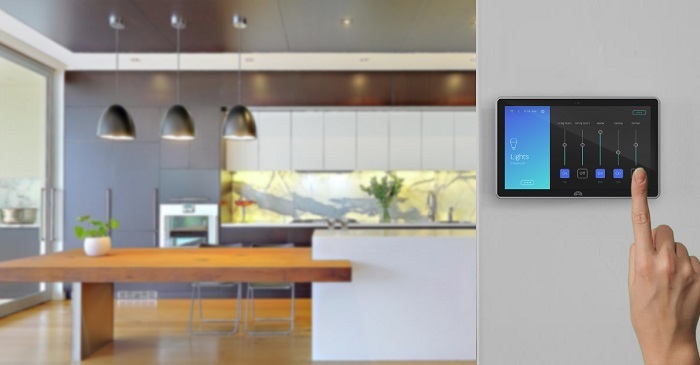 The new Atmos Smart Home Control is a fully-integrated smart home solution offering both touchscreen and voice activation to seamlessly connect and control all connected home devices at a fraction of the cost of expensive custom smart home installations. The secure, easy-to-use system, will be available for pre-order in early 2018 for $249.00 MSRP. The company recently launched an Online Public Offering (OPO) on the StartEngine equity crowdfunding platform to fund the first stage of manufacturing. Atmos was conceived from Lyle's frustration with his own smart home integration. Together with co-founder and Chief Design Officer Chris Ladwig, the engineering and design team re-envisioned the future smart home in which all connected devices will respond to commands utilizing a more integrated, intuitive system that is within reach of virtually every homeowner. "Most smart home device makers promote smartphone control as cutting-edge and convenient," explains Lyle. "The truth is that unlocking your phone, waiting for your connected device apps to open, and trying to navigate all of this on a small screen, is an inconvenient way to control the lights or adjust the temperature." Analysts at The Gartner Group estimate that by 2020 there will be more than 26 billion interconnected devices known as the Internet of Things (IoT). According to McKinsey and Company, there are already 29 million homes in the U.S. with smart home devices, and project the smart home industry to grow at a 31 percent compound annual rate. Atmos communicates and works with all of the major smart home communication standards, including Wi-Fi, Bluetooth, ZigBee, Z-Wave, and infrared. It will be compatible with most major home automation brands, including Nest, Philips Hue, Belkin WeMo, Sonos, SmartThings, DirecTV, and many others. The full list is available at atmoshome.tech. The Atmos Expand Smart Light Switch will instantly add smart lighting control without needing to replace existing bulbs. While many smart lighting systems cease to operate when a Wi-Fi signal is not present, Atmos has developed a proprietary interface between the system and switch that is far more reliable. The Atmos Surround Smart Speaker is designed from the ground up to deliver premium audio performance and to be the perfect complement to the Atmos Smart Home Control System. 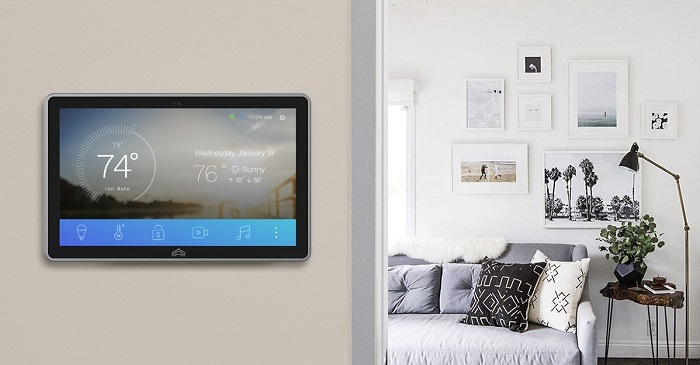 It is deeply integrated with the Atmos Smart Home Control System allowing the use of voice commands to control lights, moderate climate, start your favorite playlist, or access many of your connected devices hands-free. Mark Lyle is a successful serial entrepreneur who has been involved in the electronics design and manufacturing industry for more than 20 years as a leading software and automation engineer. He co-founded Universal Microwave Corp., which was acquired by Radio Frequency Micro Devices/Qorvo (QRVO) in 2008 for $25 million. Lyle has also developed wireless infrastructure equipment, automation robotics, as well as guidance system components for NASA. Chris Ladwig is an award-winning art director and product designer with a focus on branding and package design. His work has been featured in top design publications. Headquartered in Tampa, Florida, Atmos Home is a developer, manufacturer, and marketer of next-generation smart home control systems and peripheral devices. The company is focused on developing products and solutions that integrate thousands of smart home devices conveniently and without costly custom installation and programming. For more information, or to register to preorder the Atmos Smart Home Control System, please visit http://atmoshome.tech/. Click here to view the Atmos Smart Home Control system video. Atmos is conducting an online public offering (OPO) crowdfunding Title III offering which is currently listed on the StartEngine website. The company is raising capital through Title III crowdfunding offered to both non-accredited and accredited investors. These offerings are made through StartEngine Capital, LLC, a crowdfunding platform that empowers smaller companies to raise capital under three crowdfunding exemptions: Reg D (506c), Reg CF, and Reg A+ provided by the Jobs Act of 2012. A crowdfunding investment involves risk. You should not invest any funds in this offering unless you can afford to lose your entire investment. In making an investment decision, investors must rely on their own examination of the issuer and the terms of the offering, including the merits and risks involved. These securities have not been recommended or approved by any federal or state securities commission or regulatory authority. Furthermore, these authorities have not passed upon the accuracy or adequacy of this document. The U.S. Securities and Exchange Commission does not pass upon the merits of any securities offered or the terms of the offering, nor does it pass upon the accuracy or completeness of any offering document or literature. These securities are offered under an exemption from registration; however, the U.S. Securities and Exchange Commission has not made an independent determination that these securities are exempt from registration. Potential investors are strongly advised to consult their legal, tax and financial advisors before investing. The securities offered on this site are not offered in jurisdictions where public solicitation of offerings are not permitted; it is solely your responsibility to comply with the laws and regulations of your country of residence.